When the disciples asked Jesus what kind of happenings around the globe would signal his second coming to planet Earth, Christ hinted that other than the famines, starvation, wars, natural disasters and the fact that people would be lovers of themselves and money, there would also be some very strange happenings. 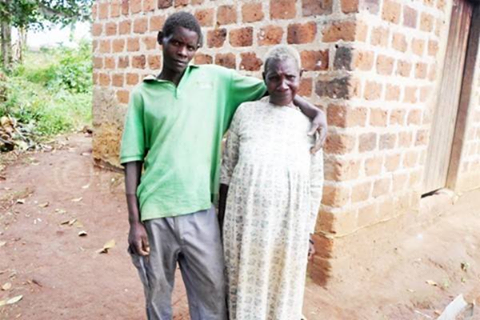 Therefore, news of a 27-year-old Ugandan man who has declared his undying love to a 70 year old grandma shouldn’t come as a surprise to Bible believing Christians. Steven Tikubuwana, is planning to marry his 70-year-old lover, Zaituni Nakanda, this year in what he says would be a serious wedding. The two met in 2014 when Steven lost his job. Nakanda took him in after he lived for two months as homeless. “I lost my job and was homeless for about two months. She welcomed me into her home. At first, she seemed afraid but later warmed up to me,” he said. He says that his family is not happy and supportive of the relationship but nothing will stop him. Steven claims that unlike his first wife, Nakanda is faithful and caring. He already had two children with his first wife and are now living with his parents in Kabale district. The man has not yet disclosed his plans to his parent but is planning to invite them to his new home before the wedding. And Nakanda says that getting a husband is a miracle since she has been single since 1993 when she left her ex husband. She is happy that the young man is willing to introduce her as his wife and is indifferent to the negative comments regarding their relationship. Nakanda also claims that she is pregnant but doctors who examined her at Mulago Hospital in the country refuted her claims. She however has refused to believe the doctors. She is childless and has never conceive or even had menstrual periods. All her siblings are dead, and it is her nephews and nieces living in Mukono who often support her. Her lover is a casual labourer in the Mukono Municipality.